We are so fortunate to live near such beautiful coastline. We have such diverse beaches and sometimes you are very lucky to enjoy a beach all to yourself! 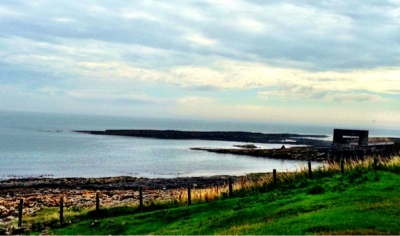 We enjoyed a piece of this coastline last year with a trip to Craster and Low Newton. 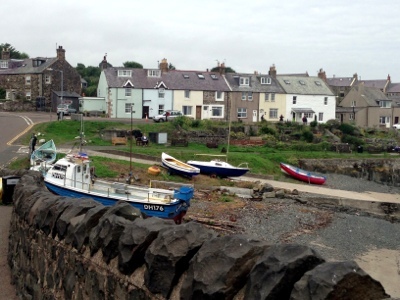 Craster is a small fishing village and has a very traditional feel. 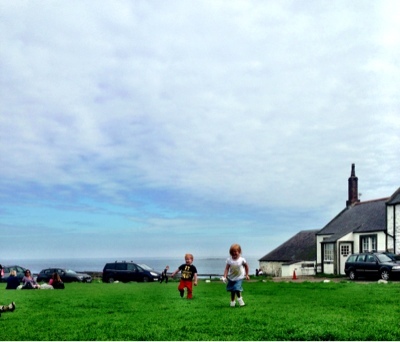 There are some beautiful seaside cottages available to rent (on my bucket list to do this! 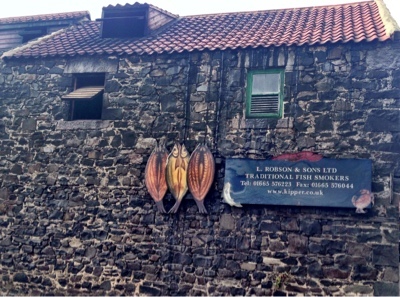 ), one friendly pub, a cafe and the famous smokehouse with adjoining restaurant and shop. There is only one car park (£2 per day) which is where the tourist information site is located. 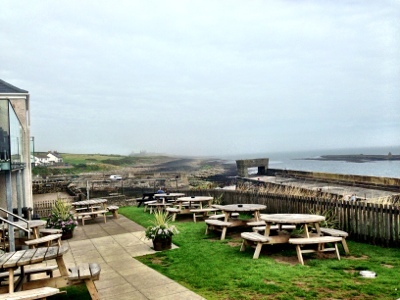 We began our visit with a trip to the beer garden at The Jolly Fisherman pub. If you are lucky to get a table here you definitely should. The views are spectacular. A pint of real ale, a freshly brewed cuppa and 3 juice's set us back just over a fiver. Very good value for money. 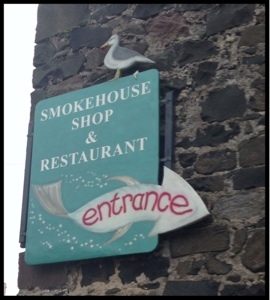 Next we paid the famous smokehouse a visit. If you go at the right time of day, the kids can watch the fishermen at work. You can also see the smoke working it's magic and the smell is very enticing! The staff in the shop are very knowledgable and happy to answer any questions. We bought 4 famous Craster kipper fishcakes, some kipper pate and 2 large scallops. Yum! Next it was time to enjoy the lovely coastal walk - it is 1.5 miles to Dunstanborough castle. We normally walk about half way and back with 3 sets of little legs to consider! The views of the castle are fantastic and there is a lot of coastline to explore. Wish we had remembered our nets and buckets! After our walk, We headed back to the car and popped into the visitor centre. The staff here were so friendly and giving lots of people advice. We gave the kids £3 pocket money each to spend for being well behaved and they were very happy with a toy unicorn, feather quill and wind up penguin! Easily pleased! 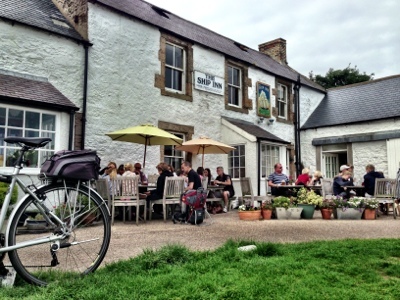 I had heard lots of great things about The Ship Inn at Low Newton but had never visited myself. It is only 5 miles from Craster and our car parking ticket could be used in the car park at Low Newton too. So off we went. The coastline here is again, absolutely beautiful. It is completely different to rocky and rustic Craster though - Low Newton is a never ending perfect sandy beach. This picture is taken on the walk from the car park down to the pub. It was a warm but overcast day when we visited The Ship Inn. I would hate to see it in the height of summer!! It is the busiest pub I have ever seen! All of the tables were taken inside and out so we joined a handful of other families and sat on the grass outside - it probably worked out better that way as the kids had freedom to run around while we waited. The menu has a strong emphasis on locally sourced food (in particular seafood) but I did find the children's menu very limited - just one choice (a children's picnic at £3.95 which does not include a drink). The food was absolutely delicious though, all home cooked and plentiful and was very good value for money. There is also a micro brewery on site! We thoroughly enjoyed our trip along the Northumbrian coast and are already planning to return in the Autumn. 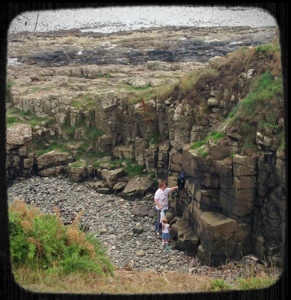 Our eldest wants to take some ropes and hooks so he can climb parts of the rocks he couldn't reach today!!!! 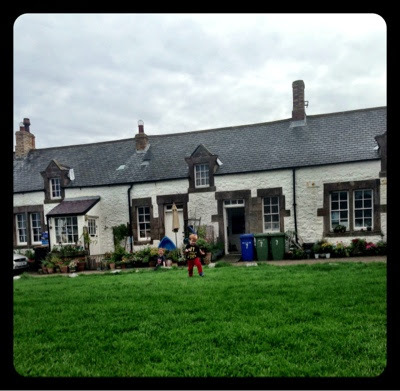 We stayed at Low Newton this Summer and had a wonderful holiday. We had to go to Craster for kippers. Very beautiful part of the world. Please can I come in your suitcase??? Fantastic - I must get to Northumberland before too long! It sounds lovely and I'm gobsmacked at how cheap everything is - £2 to park and you can transfer the ticket? £5 for a beer, tea and three soft drinks? We go on holiday to Padstow, where the beer would cost nearly £5 in itself! Good luck in the BiBs! 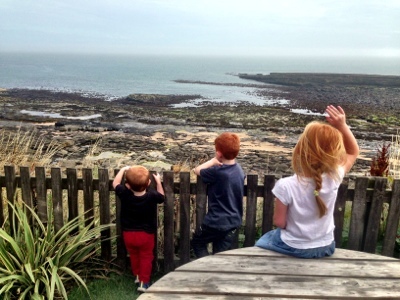 The Ship in Low Newton is brilliant, one of our pre-children faves. Did you spot any seals in the bay? 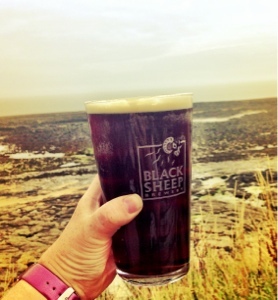 Sounds like good beer and good food, put that together with beautiful scenery and you have a perfect day out! Thank you for sharing with me on Country Kids. 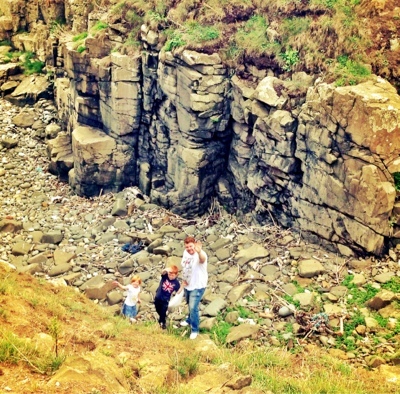 I loved going to Northumberland when I was little, must go back with my kids, your pictures make me want to! I like the sound of Craster a lot! I'm going to venture north for our holiday next year and thinking Northumberland is where we will go for some castle and coastline exploring. oh yes - Northumberland is home to no less than 45 castles!